This is the result of yesterday's adventure. 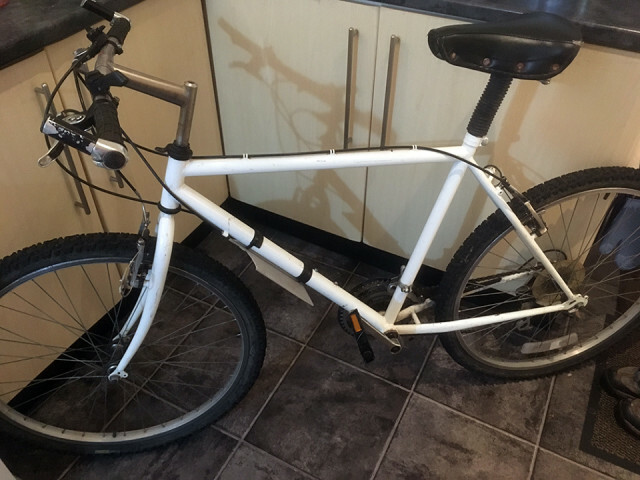 It's an odd one, it has an Orange stem and handle bar, and good brakes (Shimano servo-wave action levers and Deore XT v-brakes) but a totally blank frame and basic SIS gear levers and derailleurs. And that saddle...? Maybe it's already been franken-biked. My plan is to use it as a snow/ice bike, with my studded tyres. It goes very nicely with my non-snow/ice commuter as a matching pair. Anyway the first job is to lower the saddle and replace the brake blocks, so I can (more safely) ride it to a workshop to carry out all the other jobs.